We finally made a decision on the seats. Not what kind of seats, but at least how to mount them. We cut four 17-1/2" lengths of 5/8" channel out of 16-gauge 1" square tubing, drilled two holes in each, and welded on 5/16" blind nuts underneath. 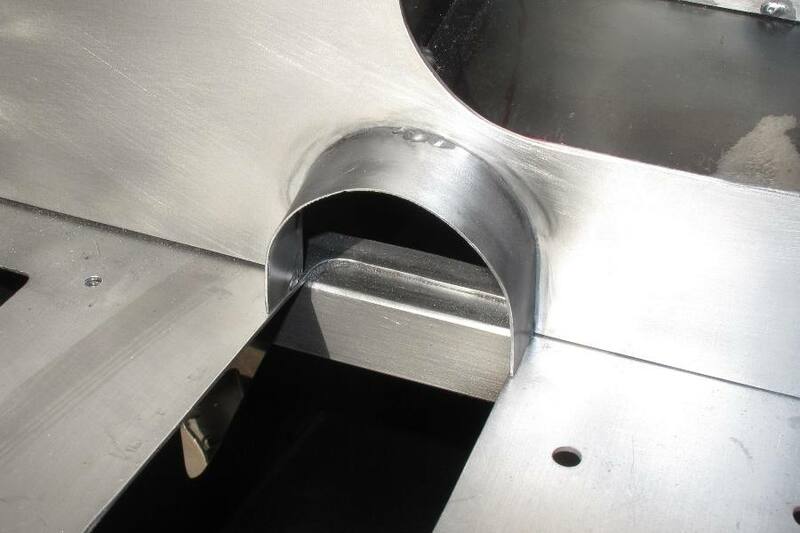 We welded these channels longitudinally to the floor, and also to a couple of frame rails. So now we can bolt anything we want to them, so long as the bolt holes are 9" apart, and we don't use anything longer than a 3/4" bolt. The channels really stiffened up the floor pans. They don't make noise anymore when you stomp on them. And because they're only 5/8" high, we're still sitting pretty close to the floor. But the best thing about bolting the seats to rails instead of the floor is that we won't have to drill holes in the floor where water, mud, and debris can get in. Although we will have to drill holes so water, mud, and debris can get out. But those will be a different kind of hole, the kind that let things out as opposed to letting things in. 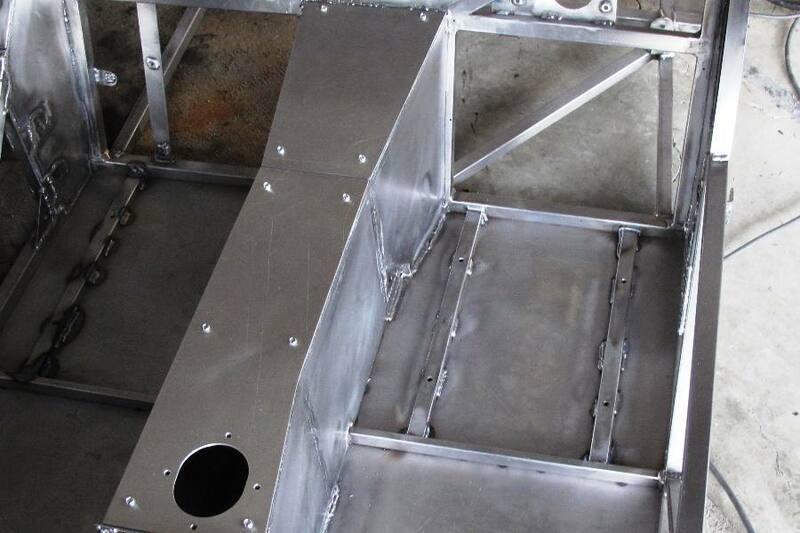 The new seat rails interfered with our new aluminum bulkhead, which was expected because that's what new parts do. So we had to cut a few notches in the bottom of the bulkhead, no big deal. What might be a bigger deal is figuring out how we're going to bolt the seats to the rails. we're hoping it'll be obvious once we decide what kind of seats we're going to use. 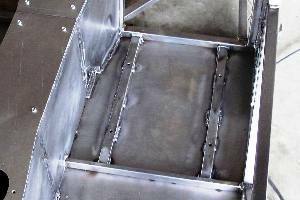 We got the firewall welded onto the scuttle, and that was a chore. The firewall has a 1/2" lip made from 1/8" thick steel, which is welded close to the outer edge of the firewall where it serves as the support for the hood (bonnet). Bending 1/8" steel is not as easy as you might imagine, even if it's only half an inch wide, so it was difficult to get the lip the same shape as the firewall. But we got it close, and in the end we liked the shape of the lip better than the shape of the firewall, so we trimmed the firewall to match. 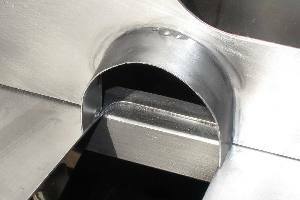 We also had to weld a flange to the firewall, for mounting a cover over the steering column. Without a cover, deadly gases from the engine compartment could escape into the passenger area. We assume they're deadly gases. We don't know for sure, but we do know you that you can't just let them into the car. So we had to make a flange. Unfortunately we don't have a lot of experience with making flanges. Tabs or brackets, sure, no problem. We pretty much know exactly how to make those. Flanges, not so much. We started with a cardboard template from a cereal box, then cut out a strip of 20 gauge steel to match, and welded it on. It actually came out okay. Of course we also have to make a cover. We have some idea what it'll look like, but we're not sure what to make it out of. 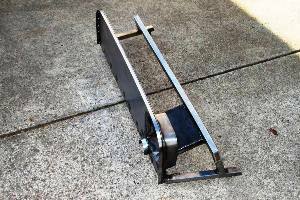 It has to be really thin to fit under the pedal support, and malleable enough to bend around the column and still lay flat on the engine bay shelf at the edges. We're leaning toward duct tape, but we're not totally sold on the idea, so we'll keep an eye out for other options. 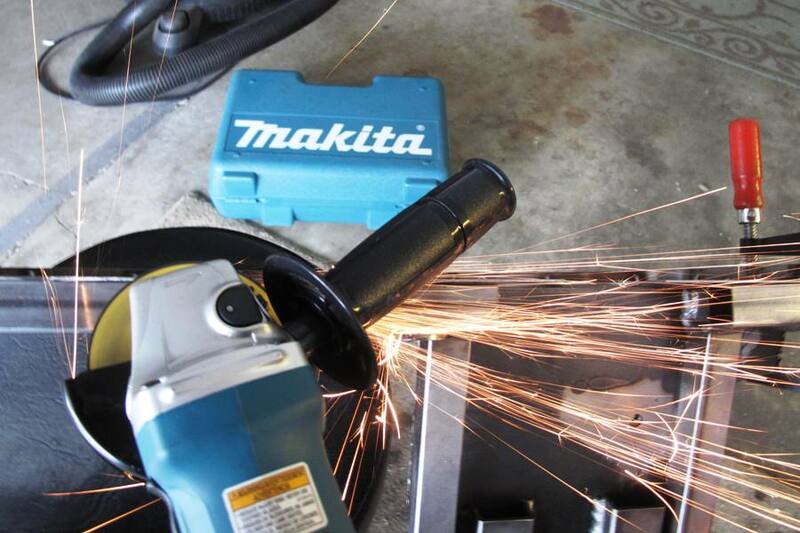 While working on the scuttle we had a chance to try out our new angle grinder. We really like it. It appears to be a lot more powerful than the HF grinder, judging by spark density. With the new grinder you have to be careful about not standing in the shower of sparks, unless you're intent on catching your clothes on fire. By the way, you should note that we won't be referring to our new angle grinder by its brand name, since this is a non-commercial website. So ignore any pictures that might accidentally contain images of the new grinder. Pictures are in fact nice source of education instead of wording, its my familiarity, what would you say? Hello Everyone! If you are involved in the binary options markets I may have something to interest you. Even if you have not been involved in the financial markets and are interested in earning some money on the side I have something which may be of interest to you. it is called AutoBinarySignals!. This is an automated system which will help you trade on the Binary Options Market. This is a �Plug-And-Play� system which you can easily set up and have operating in just a short while. With the AutoBinarySignals software system there are no difficult to understand charts, no baffling analysis, or no complex methods. This is an easy to learn system and you can have it running to earn more money.